My God we missed Don Adams' birthday! Were he alive, Adams would have been 83. Who's Don Adams? 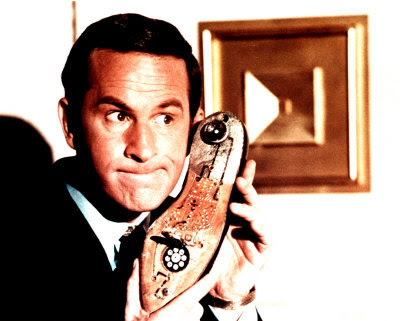 Why Adams was Agent 86, Maxwell Smart. From the warped and whacky minds of Buck Henry and Mel Brooks, Get Smart cashed in on the "spy" craze of the mid-60s and spoofed such staples of the day as James, Bond and The Man From U.N.C.L.E. It ran for 5 years - 4 on CBS and the 5th on NBC. I know one 13 year old in 1965 who sat glued to the TV when this came on because not only was the show so funny but it's co-star, Barbara Feldon, was very easy on the eyes. And I recall it was all the rage to mimic Smart at school. The show was known for such catch-phrases as "Sorry about that Chief" when Max screwed up; "Would you believe..." because Max was prone to slight exageration: and, when told he'd be facing certain danger - which was often - Max would reply "And loving it!" Me and my buddies slayed each other with these comebacks. They were kind of like the precursor of "That's what she said..."
If you want to revisit the series, all 138 episodes are available in a 25 disc box set. I know; I've got it. I know; I need a life! Adams died in 2005, but if he had made it to April 13, 2009 he would be celebrating his 83rd birthday...and loving it! I loved that show. Watched it every day at 5 p.m. It was so silly, but we laughed every time. As much as I love Steve Carell, he's got nothing on Mr. Adams. In fact, the movie sucked large balls. 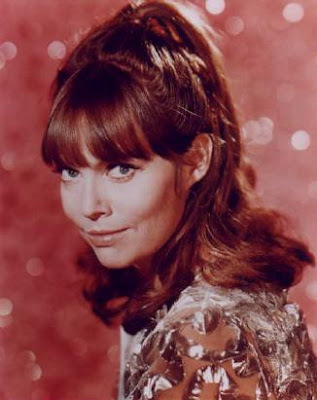 I thought Barbara Feldon was hot as hell also. I too was 13. Just right I guess for some serious fantasizing. Oh yeah, the show! It was cool. Mary: Would you believe we watched it 3x a week and laughed sometimes? How about 1x a week and we chuckled now and then? FTU: I haven't seen the Carell version but it didn't get very good reviews. Hard to improve on the original. Don: I loved all the spy gadgets that Smart always screwed up. Sorry about that Chief.